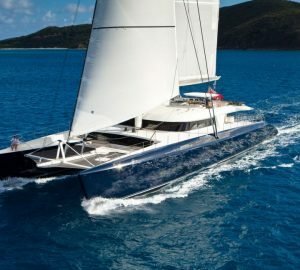 The Lagoon 620 catamaran VACOA was built by the prestigious French CNB Bordeaux shipyard in 2014 and measures 18.9m (62ft). 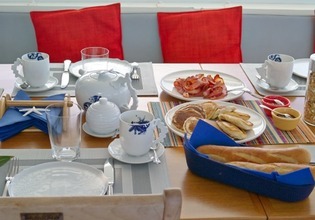 Featuring 5 double cabins, each with queen size beds and en-suite facilities, S/Y VACOA comfortably accommodates 10 guests. 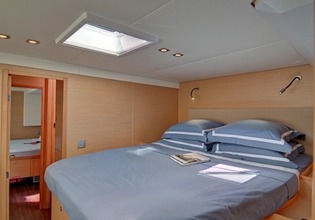 Crewed charter yacht VACOA has a light open plan contemporary interior. The generous salon features vertical windows, optimizing space, natural light and scenic views. 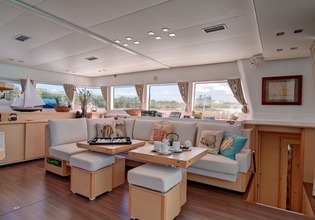 The integrated lounge and convertible dining area are on the starboard side, with a full entertainment system centered. 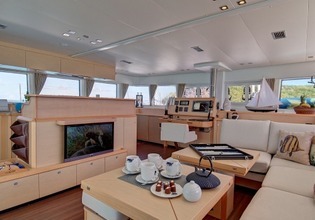 A state of the art navigation station is forward, while the well-equipped galley is on the port side. 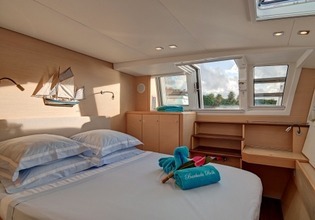 The starboard hull has 3 queen size double cabins, while the port side has 2 queen size double cabins. The crew have a further twin cabin amidships, on the port side. 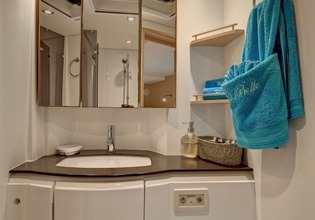 All cabins are fully air conditioned and boast the trademark one way panoramic hull windows, plenty of ports and overhead hatches. 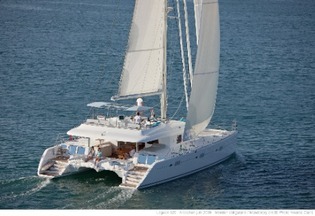 Sailing yacht VACOA is ideal for large groups with her ample exterior living areas. The main salon opens out onto a massive shaded aft deck, offering an alfresco dining option, full beam aft seating and complete wet bar. 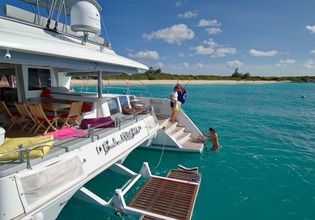 VACOA’s wide 10.06m (33ft) beam, allows for optimum stability and ease of movement around the yacht. 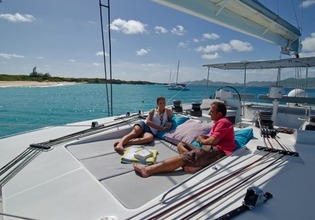 The foredeck is a favourite spot for sunning enthusiasts and star gazers, thanks to the 2 large trampolines. 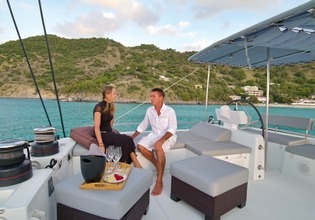 Above, the flybridge offers plenty of seating, a double sunpad and Bimini, with pull back canvas windows, great for instant shade or sun. 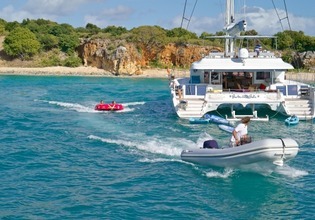 Cat VACOA has wide steps on the port and starboard transoms, fabulous for enjoying the water toys on offer, or simply taking a refreshing dip in the sea. 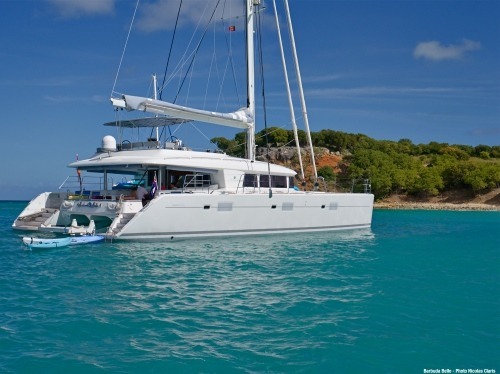 Luxury catamaran VACOA accommodates up to 10 guests, in 5 double, en-suite cabins. 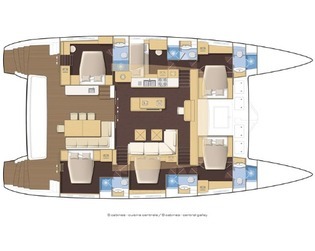 On the starboard side are 3 double cabins, the aft cabin boasts an interior and exterior entrance, the amidships and forward cabins are accessed from the salon, forward of the lounge. 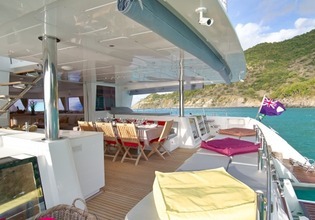 On the port side, the aft cabin has an exterior entrance only and is ideal as a private retreat. The forward port cabin is accessed from the salon, forward of the galley. 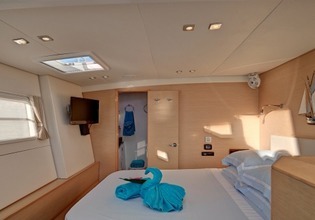 All 5 cabins have individual air conditioning and a light airy ambiance. The VACOA catamaran has the following Tenders & Toys: Hardbottom dingy 17” with 90 HP, Waterskis, wakeboard, kneeboard, kayak, 2 paddles, 1 skim board, Snorkeling equipment, Fishing gear with reels. Communications include Satellite phone, Cellular and email. Audio Visual Equipment and Deck Facilities include Hifi & DVD Home cinema Bose lifestyle TV flat screen 32” in the salon, TV Sony 22” in the 2 aft cabins, CD Hifi MP3 in each cabin, Deck shower, swimming platform tender lift, Sun bathing cushions, Flybridge with biminis, cushions and table, Board games, books, CD & DVD.